Since 2007, the companies in the sample achieved an aggregated compounded annual growth rate (CAGR) of 3%. These reports have been designed to analyze the financial performance of companies in the Knowledge Process Outsourcing (KPO) industry. The information in this series will be of interest to KPO service providers, consultancies, investment firms, and buyers of KPO services. It is aimed at providing decision makers, analysts and influencers with relevant and actionable insights. The report will enable service providers to benchmark their performance against their peers. It will help investors and consultants evaluate the financial health of their service providers. Buyers of KPO services can use this information to make informed decisions. The Financial Performance Report analyzes key financial ratios of companies that constitute the Outsourced Publishing Services (OPS) segment. 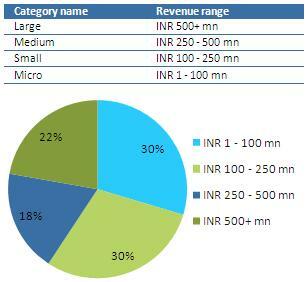 The companies covered in this report are pure-play KPOs with operations in India. Pure-play KPOs provide services for a specific segment, process or industry; in this case, the OPS segment. Only private limited companies that are incorporated in India and that filed annual returns with the Government of India’s Ministry of Corporate Affairs (MCA) are considered in the report. The information presented in this report is based on financial statements of companies between the fiscal period from 2007 and 2011. In addition, publicly available information and past research by ValueNotes on information pertaining to the companies’ service offerings and employee strength is used in this report. For more information regarding ValueNotes’ publications on the outsourced publishing services industry, refer to ValueNotes Publications. As per the reporting guidelines of the MCA, private limited companies are required to file their balance sheets, profit and loss accounts, annual returns, and compliance certificates. However, all the line items in the financial statements are not mandatory. The total number of companies that form the sample for this report is 28. Companies have been grouped into categories based on their latest reported total revenue. This has been done to allow for a more meaningful comparison of results. 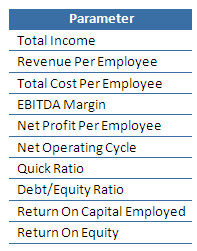 The categories, which are based on annual revenue, are depicted in Exhibit i along with the sample size of each category. 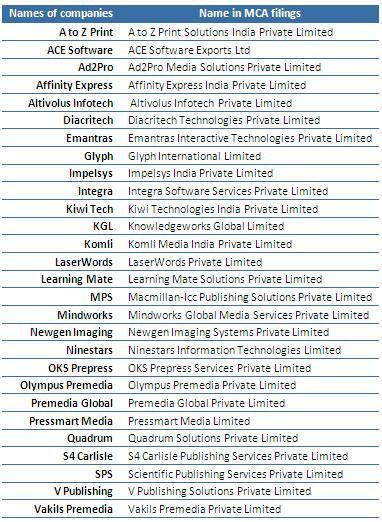 The report provides a relative positioning of Indian Publishing outsourcing service providers featured in the report. The evaluation is based on their financial performance on each of the 10 key financial ratios as listed in Exhibit ii. The methodology adopted for considering companies for inclusion in the ranking requires FY 2011 data to be available for calculating at least five of the financial ratios listed above. A relative ranking is assigned to each company based on their performance on each financial ratio. A single relative ranking is then given to each company by taking an equally weighted average of each ranking. The top five service providers are then positioned relative to each other across the ratios listed in the above exhibit, from 2007 to 2011.